4) applying these methods to study relationships between brain structure, function and cognitive performance in both healthy and diseased populations. Figure from Figley and Stroman (2011). Due to its unparallelled ability to non-invasively measure spatiotemporal changes in brain activity — either at rest, or in response to sensory, motor, or cognitive tasks — functional MRI (fMRI) has become one of the most popular methods in systems and cognitive neuroscience. However, despite 20+ years of research and fMRI’s increasing popularity, the biophysical mechanisms underlying these signal changes are still not fully understood. It is well-known that blood oxygen-level dependent (BOLD) fMRI signals result from alterations in the oxy/deoxyhemoglobin ratio, which are in turn caused by a local imbalances between cerebral blood flow (CBF) and the cerebral metabolic rate of oxygen (CMRO2). However, in order to bridge the gap between electrophysiological data – and more recently, optogenetic approaches, etc. – it is now more important than ever for researchers to understand the cellular and molecular processes that underlie functional neuroimaging signals (i.e., to better understand what is happening at the neural level). Astrocytes have been shown to play an important role in regulating cerebral microcirculation; however, the exact nature of this astrocytic involvement in producing fMRI signals is still controversial. 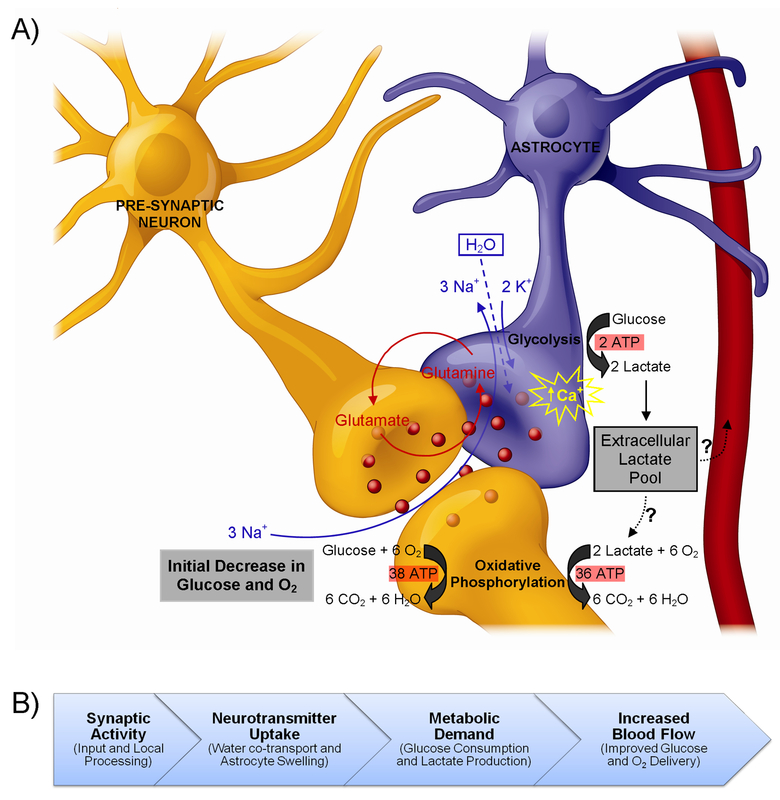 Therefore, we are currently carrying out some experiments to address one of the fundamental controversies; namely, the nature of the metabolic interactions between astrocytes and neurons. Diffusion tensor imaging data (unpublished). In addition to establishing the underlying mechanisms associated with fMRI signal changes (see above), we are also interested in determining the histopathological and proteomic bases of several white matter imaging methods [Note: white matter is like the brain’s wiring, and is therefore very important for the communication between different parts of the brain]. We are currently collaborating with clinicians and scientists in The Department of Pathology to perform radiology-pathology correlations. We are performing conventional T1- and T2-weighted scans, as well as diffusion tensor imaging (DTI), magnetization transfer (MT), myelin water imaging (MWI), and direct visualization of the short transverse relaxation component (ViSTa) scans on ex vivo brain tissue and then staining for specific proteomic markers using Multiplex Tissue Immunoblotting. Spinal cord fMRI (Figley and Stroman, 2012). Our previous work has focused, to a large extent, on optimizing data acquisition and analysis methods for spinal cord fMRI. Although fMRI is commonly used for brain mapping and studying cortical activity, the small cross-sectional area and substantial length of the spinal cord, as well as its proximity to the heart, lungs and vertebrae add a number of additional challenges. For example, we developed a method to measure cardiac-related spinal cord motion and found that the oscillations varied according to cardiac phase and spinal cord level. Based on these findings, we then developed a novel general linear model (GLM) analysis that improved the sensitivity and specificity of spinal fMRI by 15-20% and 5-6%, respectively. To push the limits of these new methods, we subsequently carried out the first successful event-related spinal fMRI study, observing spinal cord responses to repeated 1 s applications of cold thermal stimulation. The results of this study also allowed us to directly measure and characterize the SEEP impulse response function in the human spinal cord for the first time. Much of our more recent work has focused on developing new post-processing methods for analyzing quantitative white matter imaging data. If we buy into the notion that the central nervous system is organized into functional networks, where gray matter regions (i.e., neurons that are specialized for performing certain functions) are interconnected with other complementary regions, then it stands to reason that the integrity of these connections (i.e., the white matter) are extremely important. However, in traumatic brain injuries and certain white matter disorders (e.g., Multiple Sclerosis), the white matter connections are damaged and/or degraded, thereby affecting the entire network, regardless of where within the network the damage occurs. The problem is that identifying and quantifying these kinds of focal changes along an entire tract (or throughout an entire network) has not been possible with traditional analytical approaches. 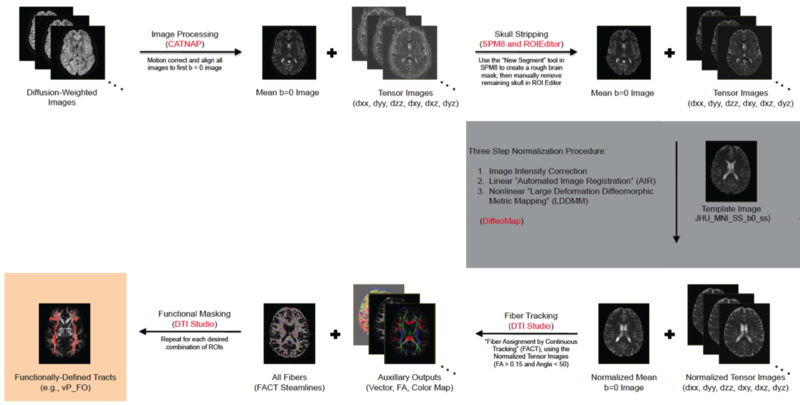 Q-TIPs Preprocessing Pipeline (Figley et al., SfN 2012). Therefore, we have been developing a tract-based analysis method, which we’re calling Quantitative Tract Integrity Profiles (Q-TIPs). By extracting information about the white matter integrity (for example, fractional anisotropy values from DTI data) along the tract, we can create subject- and tract-specific curves and compare these to other individuals (i.e., normative data) or other tracts using various curve-fitting approaches. In this way, our method will be able to quantify individual differences and evaluate changes in white matter integrity anywhere along an entire white matter tract. Another interesting aspect of this approach is that it can be applied to any type of quantitative imaging data. 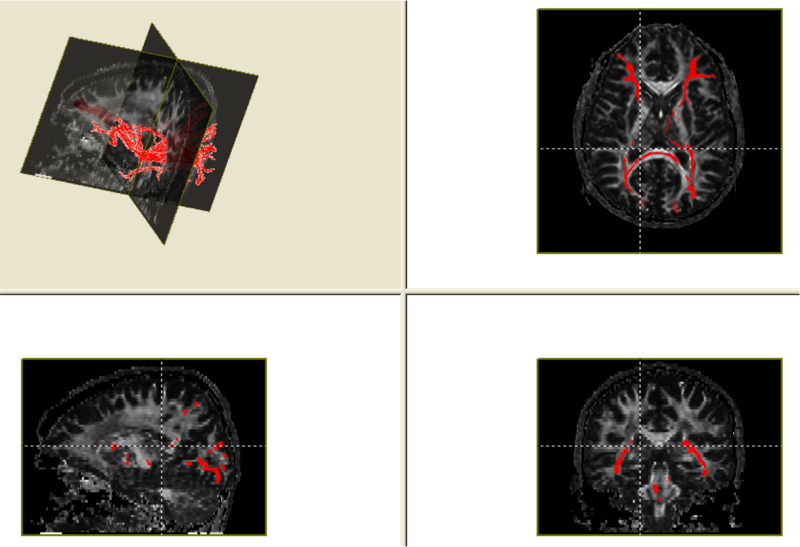 For example, we can and will be using it with diffusion tensor imaging (DTI) data, magnetization transfer ratio (MTR) data; myelin water imaging (MWI) data, and other similar white matter imaging approaches. In addition to establishing the neurophysiological bases of these methods and developing new post-processing analysis methods, we (of course) are also interested in applying them to study the human brain! Intrinsic brain connectivity vs. body composition (Figley et al., SfN 2013). One of the projects we have been working on involves characterizing individual differences in body composition — i.e., body mass index (BMI) and body fat percentage (BFP) — and how these factors affect regional gray and white matter volumes, white matter microstructure, and intrinsic functional connectivity within different brain networks. Voxel-based morphometry (VBM) was performed on high-resolution T1-weighted images to assess volumetric changes in gray and white matter that were correlated with BMI or BFP (corrected for age and gender). Diffusion tensor imaging (DTI) data were normalized using high-dimensional, non-linear warping (LDDMM) to identify regions where fractional anisotropy (FA) and mean diffusivity (MD) — both markers of microstructural integrity — were correlated with BMI or BFP (independent of age and gender). 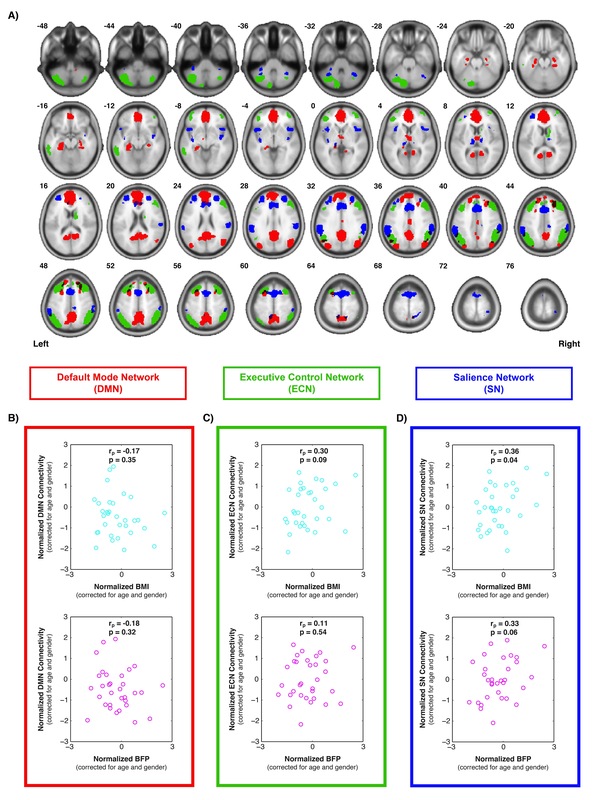 And finally, resting state fMRI was also performed to assess intrinsic functional connectivity within the default mode network (DMN), executive control network (ECN), and salience network (SN). Based on preliminary data, our results suggest that body composition is associated with significant changes in brain structure and function (independent of age or gender), and that these changes likely underlie previously reported cognitive deficits among higher body fat individuals. 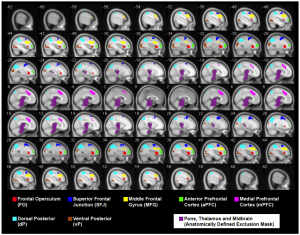 ROIs extracted from a cognitive fMRI task administered to MS patients and healthy controls (Figley et al. SfN 2012). Another one of our interests involves studying cognitive decline associated with Multiple Sclerosis (MS). Sensory and motor deficits are the hallmark symptoms of MS, and as a result, they often receive much of the clinical focus and have historically garnered most of the research attention. However, cognitive impairment is now increasingly recognized as a major and very common problem: the severity of which is exacerbated by the fact that MS, unlike most other dementing diseases, is an early-onset disorder that affects people during the prime of their life (i.e., their working and child-rearing years). Nevertheless, while it has been known for nearly two decades that 45-65% of MS patients suffer from cognitive decline, deficits in high-level executive function are mostly evaluated with neuropsychological tests and remain poorly understood in terms of the underlying changes in (and precise relations to) brain structure and function. 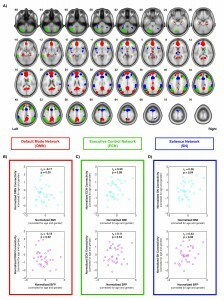 Therefore, the overarching goal of our MS-related research is to investigate individual differences in cognitive performance among both MS patients and healthy control subjects, and ultimately ascertain whether these differences are linked to variations in white matter integrity or cognitive compensation by ancillary brain regions. To address these questions, we are applying advanced brain imaging techniques – such as resting-state and task-related fMRI, as well as diffusion tensor imaging (DTI), chemical exchange saturation transfer (CEST) imaging, and multi-component T2-relaxation myelin water imaging (MWI) – to explore structure-function relationships in both the healthy and clinical populations.